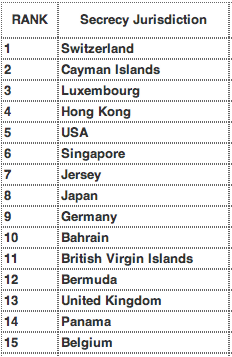 When the Tax Justice Network first published its Financial Secrecy Index many were amazed that the USA came top, and the UK was high up on the list. The USA, Germany, UK, Japan, Belgium? Secrecy jurisdictions? Oh yes. Secrecy jurisdictions are places that intentionally create regulation for the primary benefit and use of those not resident in their geographical domain. That regulation is designed to undermine the legislation or regulation of another jurisdiction. To facilitate its use secrecy jurisdictions also create a deliberate, legally backed veil of secrecy that ensures that those from outside the jurisdiction making use of its regulation cannot be identified to be doing so. 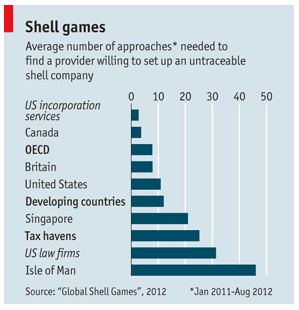 SHELL companies—which exist on paper only, with no real employees or offices—have legitimate uses. But the untraceable shell also happens to be the vehicle of choice for money launderers, bribe givers and takers, sanctions busters, tax evaders and financiers of terrorism. The trail has gone cold in many a criminal probe because law enforcers were unable to pierce a shell’s corporate veil. Yes: that's the Isle of Man doing best: they're past masters at the form filling there. This study, by far the most thorough of its kind, makes sobering reading for anyone who worries about the link between financial crime and corporate secrecy. OECD countries show little willingness to tackle their own weaknesses and end their hypocrisy. In America, by some measures the least compliant of all, the incorporation-friendly states and business groups opposing reform continue to have the upper hand, despite valiant attempts by Senator Carl Levin to push through legislation that would require the registration of beneficial owners. Movers of dirty money know where the best shells are to be had, and it is not on a Caribbean island. Now let's be clear: this tests just one issue, that's all. Many more are important which is why it in now way exactly reflects the Financial Secrecy Index. But let's not deny that this unearths an important point that many people have ignored the Tax Justice Network saying: this problem begins at home. And let's also be clear, this replicates the work I have done that shows the appalling state of company regulation in the UK. We can, and should berate tax havens. But beating tax abuse has to begin at home is the clear message.